I was camping at the New Wine Christian festival this week. On Thursday night we were out until quite late looking at the stars. There were no clouds, and very little light pollution at the Royal Bath and West Showground in Shepton Mallet. Someone had an App on their mobile phone that you could point at the sky and it would tell which star or constellations you were looking at. There are many ways to look at the night sky, but I was practicing two mindful ways. One is the way of focused attention, just looking at one star, or constellation. The focus of awareness is like a narrow beam of a torch. In that way you can identify a star or constellation. Another way to look is the way of open awareness or open monitoring, a key distinctive of the universal human capacity to be mindful – where you try and open your awareness to the whole night sky, without focusing on one particular star or constellation. What I saw when I did that was three different satellites (I assumed they were satellites) darting across the sky. 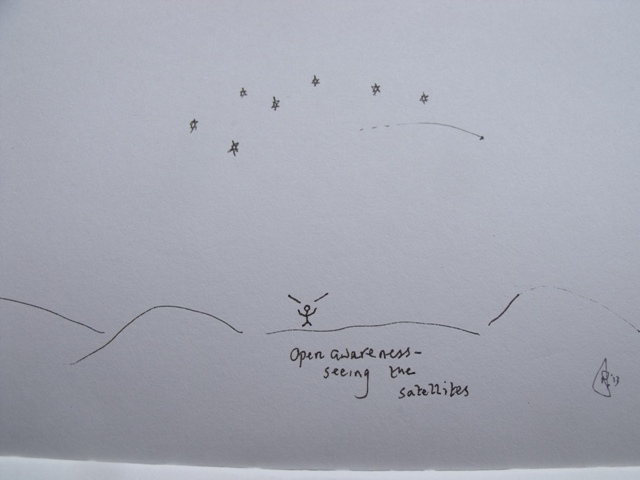 Open awareness or monitoring helps us to see things that we wouldn’t see otherwise, it is a much broader beam of light, rather than a narrow beam. In London I rarely see a good night sky because of light pollution. Although everyone has a capacity to be aware and attentive (mindfulness is a universal human capacity), when our minds are untrained in this way we often suffer from awareness pollution, we don’t see as clearly as we could. Mindfulness training helps clear the night sky of our minds so that we can see more clearly. Mindfulness of God is another dimension to awareness and attention that takes us to a place of clearer seeing. Christians are called to be like the Wakeful One, Jesus, the master and commander of attention and awareness.